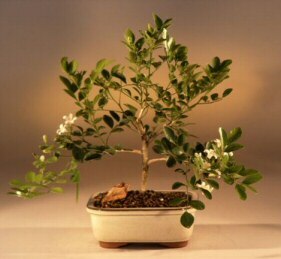 The Orange Jasmine (murraya paniculata), also known as "satinwood", is a small tree that belongs to the Rue family. The very fragrant white "orange blossom" flowers stand out against the evergreen dark foliage. This evergreen tree flowers at intervals throughout the year and produces fragrant orange jasmine scented flowers and striking bright orange-to-red fruit. It makes an outstanding indoor flowering bonsai tree due to its compact habit and dense glossy green foliage.